Axzbryg.trade is the PUP that uses misleading techniques to prevent removal. Use Reimage to locate malicious components and get rid of them faster than with uninstall instructions. A full system scan blocks virus reappearance and prevents traffic to malicious domains. What are the main features of the Axzbryg.trade virus? How can this virus exploit software packages to get into your computer? What is the safest way to remove Axzbryg.trade from your computer? 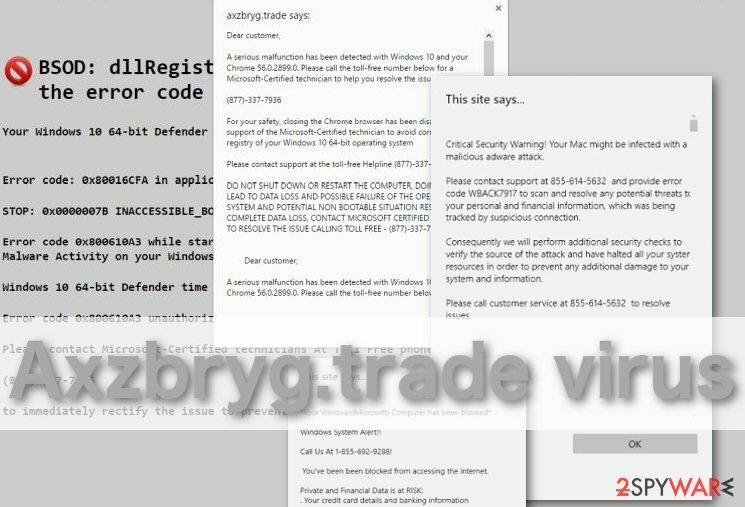 Axzbryg.trade virus is a shady website that displays bogus security notifications and tries to trick people into contacting the cybercriminals who pretend to be tech support specialists. The scammers are attempting to sell the unsuspecting users services or software that are barely useful or entirely fake. Such scamming technique has been growing especially popular over the last year, and we have already discussed similar applications in our previous articles. Nevertheless, each malicious program is different and has its own features that are characteristic specifically to it. For instance, to contact the criminals behind this specific virus you have to ring up (877)-337-7936, while some other scam may use a completely different number. Thus, it is important to discuss these newly-appeared programs individually. In this article, you will find all the important information about this pop-up virus while in the guide at the end of the article our experts will also provide comprehensive step-by-step Axzbryg.trade removal instructions. Axzbryg.trade malware possesses qualities that are attributable to most tech support scams. We should emphasize, though, that it is not a stand-alone infection. 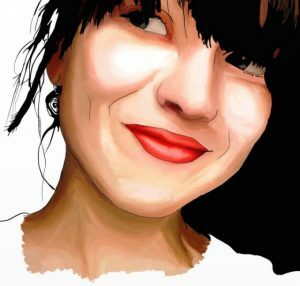 Axzbryg.trade pop-up ads are brought by some other potentially unwanted program, usually, an adware that arrives at the computer in freeware or shareware packages. These pop-ups claim that the user’s device has experienced a serious malfunction and that there is an urgent need of professional assistance in order to fix it. To protect these ads from being exposed as a scam, the criminals threaten the users against taking any independent action and warn that this may lead to data loss or even the operating system failure. On top of it all, with the help of these ads, Axzbryg.trade redirect the users to unexpected and potentially dangerous domains on which the computer can be quickly infected with some undesirable malware. Be careful — tech support ads are just a small part of the large advertising campaign that the adware tries to implement on your browser. So, it is best to stay away from any suspicious offers that you may receive while browsing online. In general, it is recommended that you remove Axzbryg.trade virus from the computer as soon as it manages to get there — this way you prevent the parasite from taking root on your system. In the meanwhile, you should not sign any shady deals or purchase suspicious products that random pop-ups may coax you into obtaining. Though Axzbryg.trade is categorized as a tech support virus, it is still adware which spreads attached to various freeware or shareware packages. This potentially unwanted program is disguised as an optional install that comes with download managers, audio/video players, photo editing utilities or any other software that is popular among the users. To make sure that your downloaded freeware package does not contain Axzbryg.trade or any other secretly bundled components, use the expanded “Advanced” or “Custom” modes which will give you the power to manage the installation step-by-step. This means that you will be able to opt out software package components that you find unnecessary. The safest and the most guaranteed way to remove Axzbryg.trade or any other potentially unwanted infection is by employing specialized help — automatic anti-malware utilities, in particular. Though some users may think they are more in control when dealing with the Axzbryg.trade virus manually, in reality, this approach is riskier. You may leave some of the virus components undetected and give way for the infection to continue terrorizing you. Nevertheless, if you already have experience eliminating adware, you may try to remove Axzbryg.trade following the guidelines our experts provide below. What you should know before preparing yourself to remove Axzbryg.trade manually is that this virus will hide on your computer under different name. This means that you will not find a program running on your computer as Axzbryg.trade. Thus, you should investigate all of your recently installed programs very closely and eliminate the ones that might be related to adwares. Here, look for Axzbryg.trade or any other recently installed suspicious programs. Axzbryg.trade pop-ups do not appear on their own and are carried by an adware, so when trying to remove it from the computer, don’t expect it to be labeled like Axzbryg.trade or something along those lines. Look for software that has been recently installed on your computer without your permission and remove it from the applications list if it turns out to be infectious. Wait until you see Applications folder and look for Axzbryg.trade or any other suspicious programs on it. Now right click on every of such entries and select Move to Trash. When in the new window, check Delete personal settings and select Reset again to complete Axzbryg.trade removal. Once these steps are finished, Axzbryg.trade should be removed from your Microsoft Edge browser. Here, select Axzbryg.trade and other questionable plugins. Click Remove to delete these entries. Now you will see Reset Firefox to its default state message with Reset Firefox button. Click this button for several times and complete Axzbryg.trade removal. Here, select Axzbryg.trade and other malicious plugins and select trash icon to delete these entries. Click Reset to confirm this action and complete Axzbryg.trade removal. Here, select Extensions and look for Axzbryg.trade or other suspicious entries. Click on the Uninstall button to get rid each of them. Now you will see a detailed dialog window filled with reset options. All of those options are usually checked, but you can specify which of them you want to reset. Click the Reset button to complete Axzbryg.trade removal process. This entry was posted on 2016-11-04 at 02:23 and is filed under Adware, Viruses. You can quickly scan the QR code with your mobile device and have Axzbryg.trade virus manual removal instructions right in your pocket. How did you remove Axzbryg.trade virus?